Kathleen Merrigan is an expert in food and agriculture, celebrated by Time Magazine as one of the 100 Most Influential People in the World in 2010. Currently she is the Kelly and Brian Swette Professor in the School of Sustainability and executive director of the Swette Center for Sustainable Food Systems at Arizona State University. 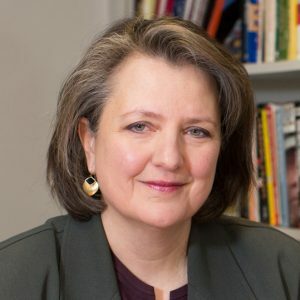 From 2013-2018, she was executive director of sustainability, director of the GW Food Institute, and professor of public policy at George Washington University. From 2009 to 2013, Ms. Merrigan served as deputy secretary and chief operating officer of the United States Department of Agriculture, a 110,000 person, $150 billion federal department. Ms. Merrigan has been actively involved with the United Nations Food and Agriculture Organization since 1998, serving in various roles including delegation head, chairman and lecturer. She is currently a board member of FoodCorps, Stone Barns Center for Food and Agriculture, Center for Climate and Energy Solutions (C2ES) and the World Agroforestry Centre (ICRAF). She is a partner in Astanor Ventures and an advisor to S2G Ventures, two firms investing in ag-tech innovations. Ms. Merrigan holds a Ph.D in Public Policy and Environmental Planning from Massachusetts Institute of Technology, a M.A. in Public Affairs from University of Texas at Austin, and a B.A. from Williams College.